Scripting languages are not new; in fact, developers have been using scripting languages for a while. While scripting languages were primarily used on Linux and UNIX machines for stuffs such as scripting tasks that automate platform customizations, software installations, and one-shot command line jobs with bash scripts. Server side scripting languages such as PHP have also been in trend for developing high-volume websites and server side languages are the best suited for serious business applications. Generally, scripting languages are platform independent and they do not usually interact with others. However, the integration is not always natural or intuitive. This is where Groovy comes to the picture. It seeks to fill that gap by integrating the power of advanced language features to the Java platform. Groovy brings a genuine innovative language that can efficiently and effectively interact with Java by living on the same virtual machine. 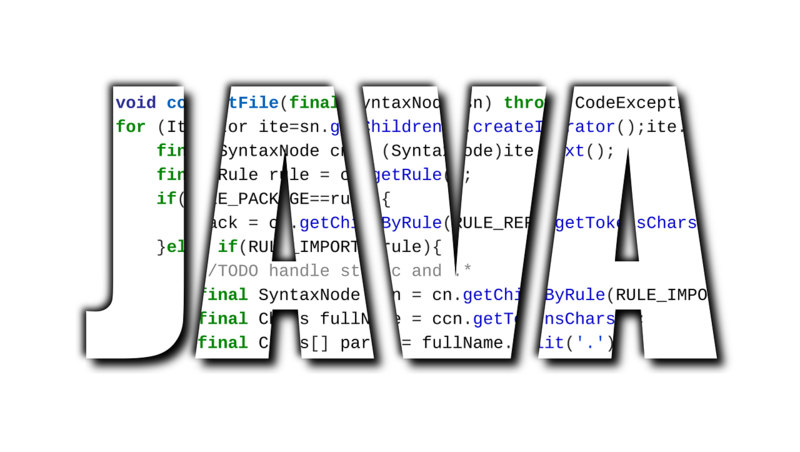 Although Java is one of the most popular and widely used programming languages for developing content on the Web but tasks like file handling and string manipulation can be a little pain in Java. Groovy brings an intuitive and expressive Java-like syntax to ease the learning curve for Java developers. It can be used in various situations from data crunching to string manipulation to experimenting with new APIs. And the best part, Groovy conveniently builds on your existing experience with the Java platform, allowing you to combine the two seamlessly. Let’s take a look at some key differences between the two. Apache Groovy is a well-known Java scripting language based on object-oriented programming with static-typing and static compilation capabilities. Usually, scripting languages do not interact well with others and while bindings do exist for bridging with other systems, the integration is not always intuitive. Groovy seeks to fill that gap by bringing in a genuine innovative language that can efficiently and effectively interact with Java by living on the same virtual machine. It is distributed via the Apache License v 2.0. Learning Groovy is a wise investment as it brings a concise and expressive Java-like syntax to ease the learning curve for Java developers. The Java programming language is a state-of-the-art, object-oriented language suitable for building a variety of applications and for projects in which machine independence is less important. It has syntax similar to that of C and it’s the language in which Java applications, applets, servlets, and components are written. When a Java program is compiled, it is converted to byte codes that are the portable machine language of a CPU architecture known as the Java Virtual Machine (JVM), which can be implemented directly in hardware, but is usually implemented in the form of a software program that interprets and executes byte codes. The language is indeed valuable for distributed network environments like the Web. In Java, the default access for an identifier is “package” except for members of interfaces, which are public. When no access modifier is specified for fields, methods, or class, it becomes package-private meaning it is visible only within its own package. Groovy shares much of the same syntax as Java but they are not same. By default, Groovy considers its package protected classes and methods public meaning you do not need to import packages explicitly in Groovy. Getters and Setters are ordinary functions in Java that encapsulate the fields of a class by making them accessible only through its public methods. To access the state of the managed bean, you need to provide getter and setter methods for that state. Getters and Setters in Groovy, on the other hand, are automatically generated for the class, which in turn, provide the necessary support whereby an instance of a class can be created using named parameters without the need to include a parameterized constructor in the class. Specifying type information is mandatory in Java, but this is not the case with Groovy. You do not necessarily need to specify a primitive type in Groovy to create an object because the “def” keyword fills the hole. Declaring a return type is optional and if no modifiers or return type are specified, the def keyword compensates for that. The compiler is smart enough to detect the value type and when the def keyword is used, the return type is deemed to be untyped. Exception handling in Groovy is the same as in java but there’s a catch: every exception is optional in Groovy which also goes for checked and unchecked exceptions as well. There is literally no difference between checked and unchecked exceptions in Groovy. The Java exception-handling scheme distinguishes between checked and unchecked exceptions. Any exception object that is an Error is unchecked. Any exception object that is an Exception is checked, unless it is a subclass of java.lang.RuntimeException. Although Java is one of the most popular and widely used programming languages for developing content on the Web but tasks like file handling and string manipulation can be a little pain in Java. Groovy brings an intuitive and expressive Java-like syntax to ease the learning curve for Java developers. It can be used in various situations from data crunching to string manipulation to experimenting with new APIs. Groovy brings a genuine innovative language that can efficiently and effectively interact with Java by living on the same virtual machine. Sagar Khillar. 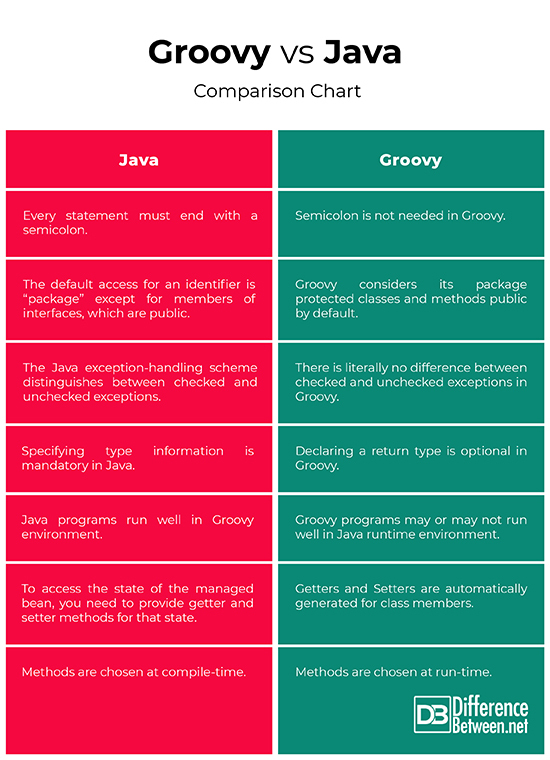 "Difference Between Groovy and Java." DifferenceBetween.net. January 10, 2019 < http://www.differencebetween.net/technology/difference-between-groovy-and-java/ >.